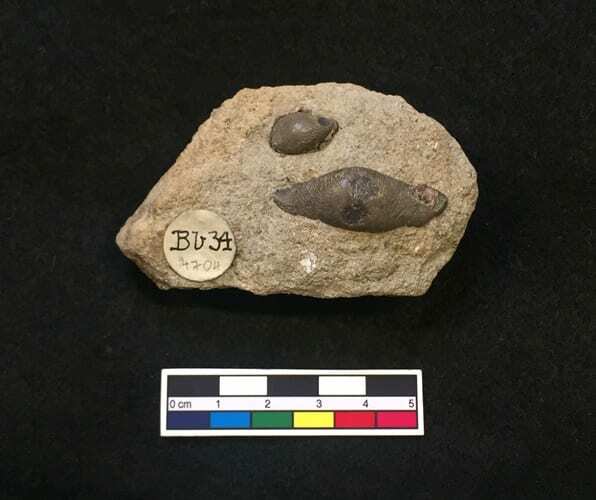 Following on from last week’s Specimen of the Week with a rockstar* connection, this month’s underwhelming fossil fish also has a famous connection, albeit in name only. Can you wait to find out what it is? I know I can. Here’s this month’s fossil fish, which bears a resemblance to mysterious remains of sea monsters a.k.a decomposing marine mammal carcasses. However, this fossil fish is far less interesting than that of a decomposing marine mammal as we can see from an alternative angle. According the ever reliable label for this specimen, these are teeth from Acrodus anningiae, an extinct species of cartilaginous fish, the group of fishes that includes sharks, skates and rays. These teeth of Acrodus annigiae are hard and round and would have been part of a battery of teeth thought to be for crushing hard-shelled animals such as molluscs and crabs (eating hard things is called durophagy). There is general confusion around exactly when these common fossils occurred with different sources giving wildly different ranges. The specimen itself is labelled as Bathonian which is the Middle Jurassic around 160 million years ago. Other resources give a much earlier range, around 180 million years ago. More generally, Acrodus was a very long-lived group appearing in the Permian, lasting through the Mesozoic and eventually disappearing around 50 million years ago. Preservation Acrodus and the related genus Hybodus are commonly found fossils, however, it is mostly the hard teeth as we have here that are found. As these are cartilaginous fish, with a skeleton made of cartilage rather than bone, not very much is known about the skeleton of these animals. The hard teeth are much more resistant to decomposition and Acrodus specimens are either isolated teeth like the specimens here (sometimes called leech fossils for their resemblance to the blood sucking worms- see image below) or more rarely entire batteries of teeth preserved in life position are found. Here we seem to have a mix of teeth sizes suggesting that these teeth aren’t from a neat associated assemblage but were probably from an animal which had been decomposed and broken apart a bit. Left: A leech. Right: LDUCZ-V1997 Acrodus anningiae. Scientific Research Much like when the washing up in a shared kitchen hasn’t been done for three days, the affinities and relationships of Acrodus, Hybodus and Acrodus anningiae is a bloody mess and it’s not my turn to clean it up because I did it last time and I don’t even drink coffee so I don’t see why I need to scrape the grits out of the cafetiere. Louis Agassiz coined the name in 1837 and in 1864, Day comments that “Few amongst the Fish-remains preserved to us in the Secondary rocks are more commonly met with than those of Sharks of the genera Acrodus and Hybodus; yet, not-withstanding the frequency of their occurrence, we have but little exact knowledge of the form and affinities of the fish to which these remains belonged” (Day 1864). In 1993, Duffin writes “The teeth of the hybodont shark species from Lyme Regis are in considerable need of review. Scant attention has been paid to them since their original description….. It is difficult to distil differential diagnoses from the available literature” (Duffin 1993). Currently at least 28 species of Acrodus exist in the literature but the diagnostic characters, age ranges, habitats, ecologies and relationship to closely affiliated taxa still require better definition. Left: LDUCZ-V1997 Acrodus anningiae Right: A moustache. In Society Acrodus annigiae was named in 1837 by Palaeoichthyologist legend Louis Agassiz after another legend of palaeontology, Mary Anning. Mary Anning is the most celebrated-for-being-‘uncelebrated’ palaeontologist of all time. At least a dozen books, several documentaries and a century old tongue-twister chart her forgotten life and are inspired by her overlooked palaeontological work. At least three sets of stamps commemorating her unremembered contributions to science have been commissioned. Fossil specimens collected by Mary have ended up forgotten in virtually every natural history museum in the UK (and further afield). On average, a museum gallery guide dresses up as the unknown Mary Anning for live interpretation sessions every two minutes in the UK. Every year the BBC runs several radio, TV and online programmes reminding us of just how forgotten her contributions to science still are. Two species of fish, one species of ichthyosaur, one species of ostracod, a bivalve genus, a plesiosaur genus and enigmatic amniote Anningia and a marine biology research vessel have been named after her. Day, E. (1864). III. On Acrodus anningiæ, Agass. ; with Remarks upon the Affinities of the Genera Acrodus and Hybodus. Geological Magazine, 1(2), 57-65. Duffin, C. J. (1993). Teeth of Hybodus (Selachii) from the Early Jurassic of Lyme Regis, Dorset (southern England): preliminary note. Elasmobranches et Stratigraphie. Belgian Geological Survey 264: 45-52. * In the strictly geological sense.